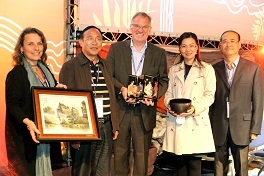 All UNESCO Global Geoparks are encouraged to form international partnerships with other Geoparks. By establishing a partnership between the two Geoparks, the aim is to form new working links as well as strengthening the existing relationship. This is achieved through exchanging scientific information, communicating best practice and collaborating in areas such as research, education and training. 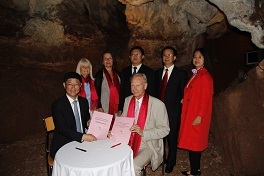 Hong Kong UNESCO Global Geopark, Hong Kong, China – Agreement signed in November 2009 (Left: Alan Wong, Middle: Melanie Border, English Riviera Geopark Coordinator). The English Riviera signed the partnership agreement with Hong Kong at the same time as Kanawinka, Australia, Yandanshan, China and Itigowa, Japan. Tianzhushan UNESCO Global Geopark, Anhui Province, China – Agreement signed in June 2017 (Front: Mr Zhang Jinsong, Party Secretary of Qianshan County Party Committee and Mayor Gordon Oliver. 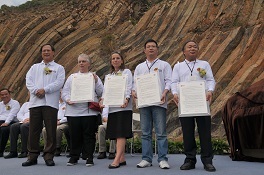 Back: Cllr Nicole Amil, Melanie Border Geopark Coordinator, Mr Tu Gaosheng, Chief of Tianzhushan Global Geopark Administration Committee, Mr Kang Liuqing, Director of Tourist Administration of Qianshan County Government).